The winds have shifted and now the prevailing winds are coming from a North-Easterly direction, usually bringing heavy rains to many parts of South-East Asia. The monsoon months traditionally brings closure to many activities in nature areas in Malaysia, where the national parks and nature reserves are closed for the safety of visitors. I recall being shown the flood level at Endau-Rompin National Park in Malaysia, where the debris from a recent flood clearly indicated the water line before the water receded. Nothing out of the ordinary, except that the debris line was about two-thirds up a line of trees that was about 15m high! The 11th month of the year, November always brings happy anticipation of the Christmas holiday season. Indeed, cheery and glittering decorations are already up in many shopping malls in Singapore. In multi-cultural Singapore, November 2010 also saw the celebration of Deepavali and Hari Raya Haji by the Hindu and Muslim communities respectively. 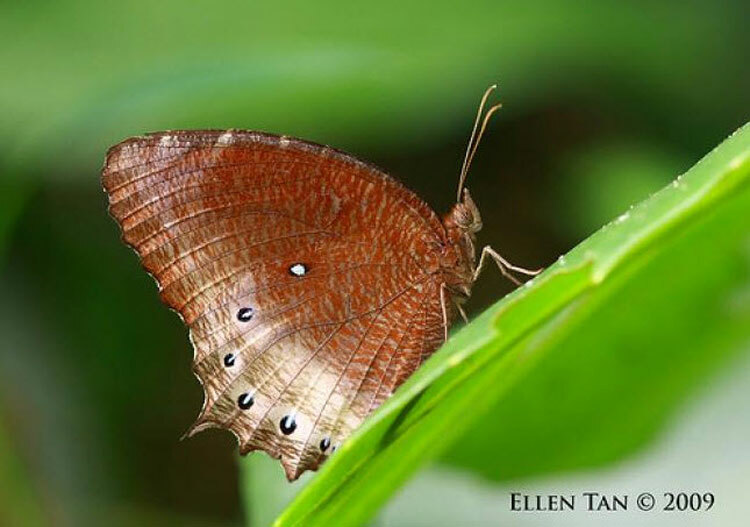 This month, we feature a relatively 'plain-Jane' butterfly, the Tawny Palmfly (Elymnias panthera panthera). The English common name of the butterfly is rather curious, as "tawny" often refers to a "warm sandy colour" which the species displays very little of. 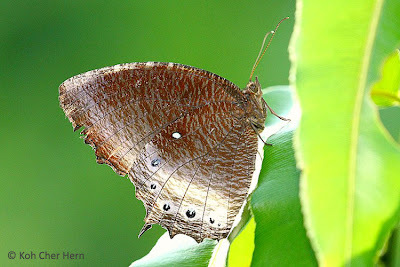 Perhaps the pale buff submarginal border on the upperside of the hindwing is distinctive enough to give the butterfly a 'tawny' descriptor. Another unique feature of this species is its scientific name. 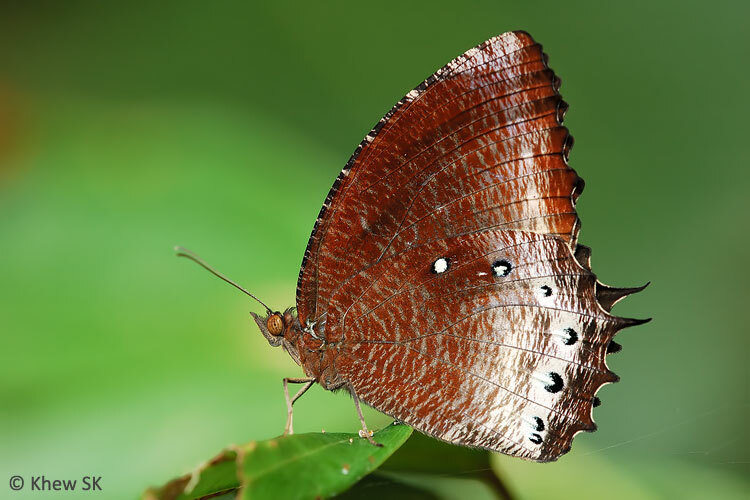 It is one of only a handful of butterfly species to share the name of mammals and in this case, a specific genus of the big cats, Panthera. 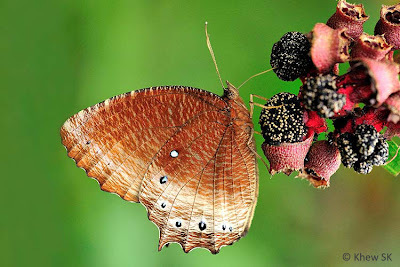 A rather interesting reference, since the butterfly bears no resemblance in any way to the famous carnivorous and predatory cats. 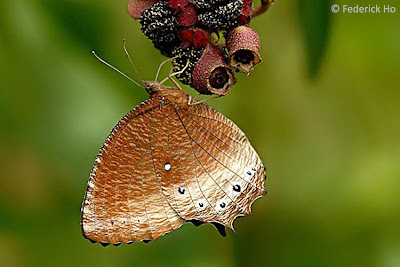 The Tawny Palmfly is a forest denizen, where it skulks close to the forest floor in well-shaded localities. 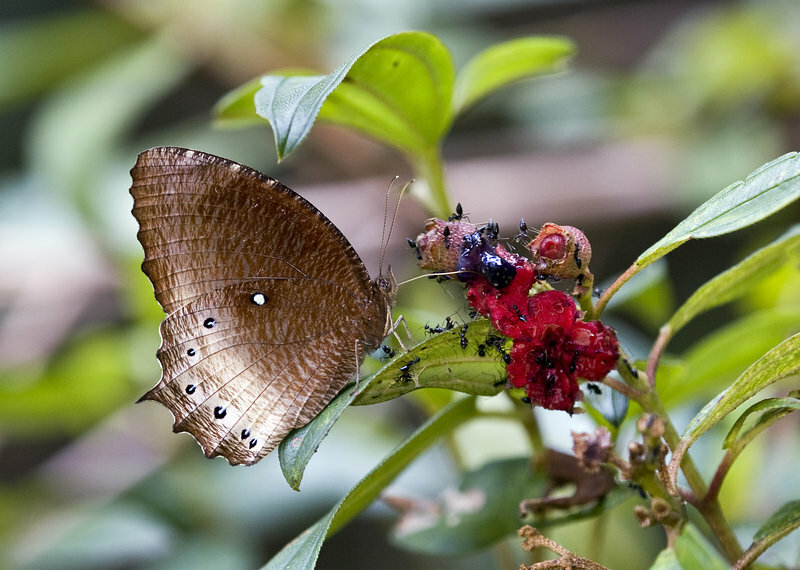 It is usually very skittish and flies off the moment it senses any movement towards it. 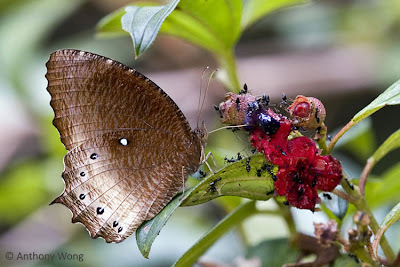 The species is best observed when feeding on the ripened fruits of the Singapore Rhododendron (Melastoma malabathricum) - when it is less skittish and allows an observer to move in closer to it. 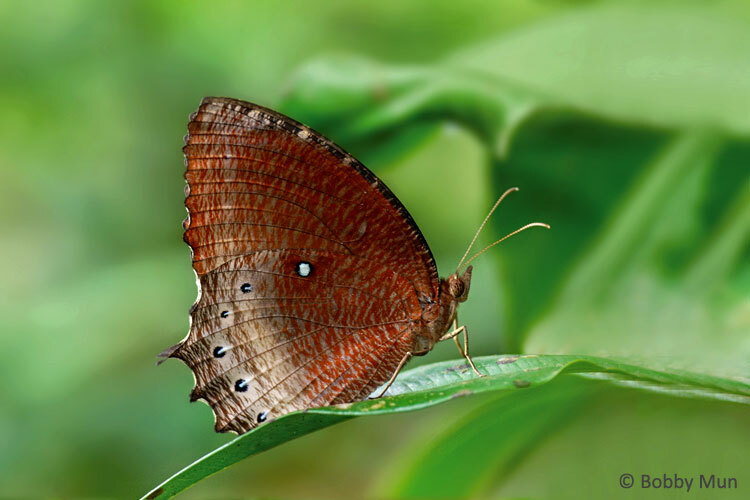 It doesn't fly rapidly but displays an erratic flight when flying around, searching for food sources or moving around its preferred habitats. 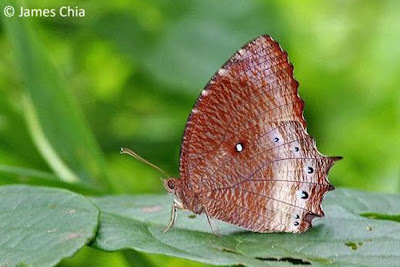 Very often, it stops and perches on the upper surfaces of leaves with its wings folded upright. In the field, we have, thus far, not encountered an individual sunbathing with its wings opened flat before. 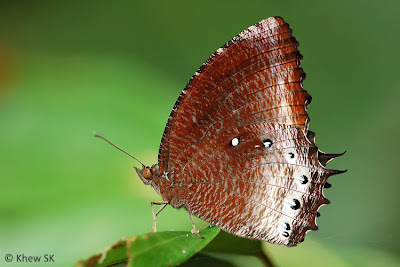 The Tawny Palmfly is dark brown above and the hindwing has a pale buff border bearing a series of white-centred black submarginal spots. The underside bears the usual reddish-brown striations of the genus Elymnias (collectively called the Palmflies) which helps to camouflage the butterfly when settled amongst the forest litter. 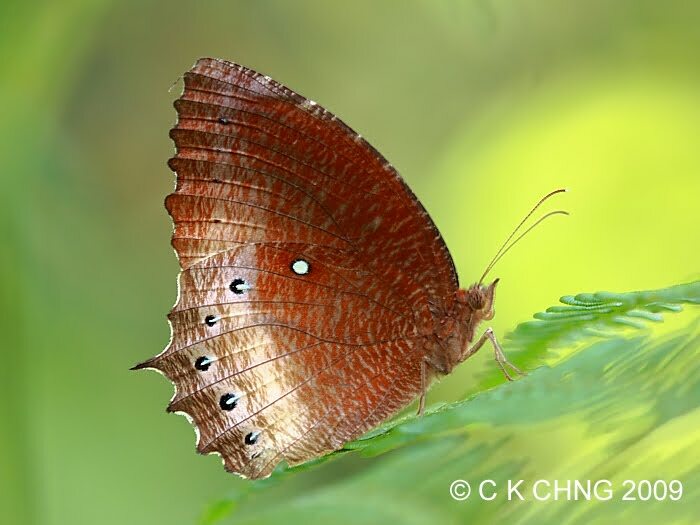 The female of this species makes an interesting audible clicking sound with its hindwings when it flutters about its host plant laying eggs. The caterpillar of this species feeds on a variety of palms found in the forests. 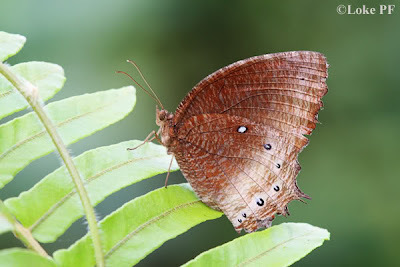 Although it is a species that is primarily found in forested areas, and in particular, in habitats where various species of Palmae grow, it has also been observed with regularity at urban parks and gardens as well. Sometimes it flies in the company of its closely related species, the Common Palmfly.